Registrations have opened for the Odysseus Space Science Challenge. This is your chance to win high-value prizes, international travel, career-shaping internships and a unique learning experience. The contest offers a unique learning experience for everyone involved. It allows students to push the boundaries of their knowledge by discovering answers to fundamental scientific questions. Pioneers and Explorers first compete in their respective countries. National winners are then invited to take part in a larger regional competition. Regional winners in turn qualify to present their projects at the pan-European finals to be held in France in July, 2017. 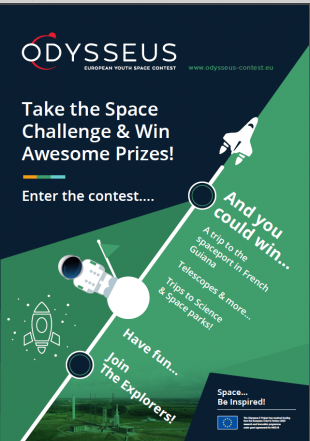 In the case of Skywalkers (competing with space-themed artworks) national and pan-European winners will be chosen. Successful Pioneers and Explorers who proceed to the regional and pan-European finals will enjoy expenses-paid travel and accommodation. They also have a shot at winning computerized telescopes, internships at space agencies (or aerospace companies) and trips to the European spaceport in French Guiana, South America. Skywalkers are eligible to win rocket kits and/or iPads. 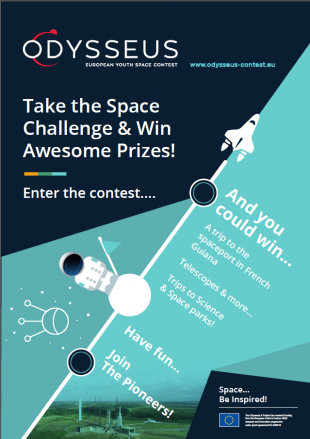 Participants can develop projects addressing virtually any space-related topic - from satellites and space probes to astrobiology and interplanetary travel.